Tomorrow (9/29) is National Coffee Day! 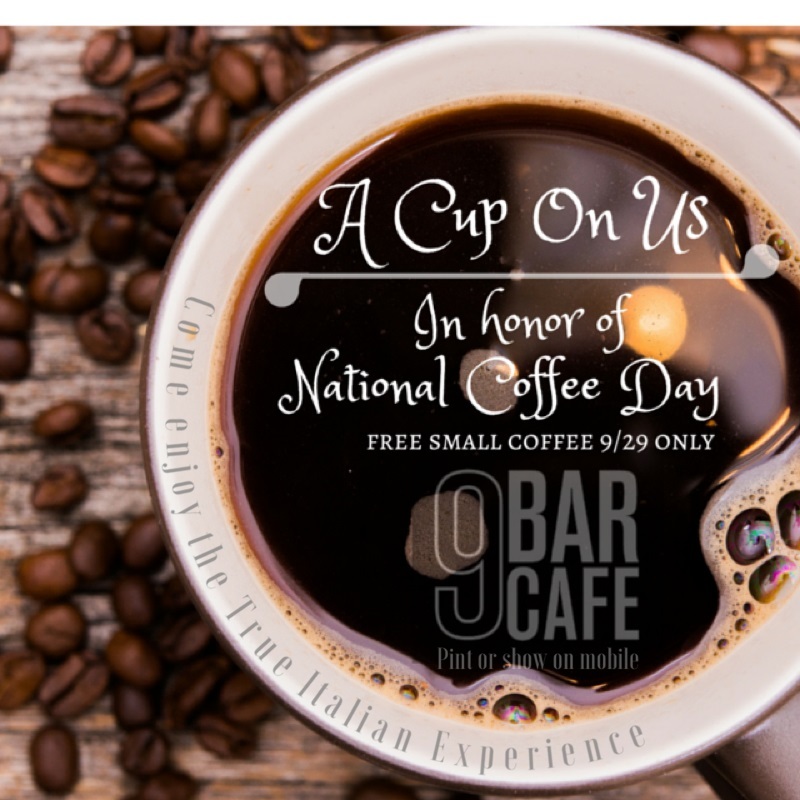 To celebrate, 9 Bar Cafe will be giving out free 12 oz coffees to anyone who goes into the shop and shows the picture above. If you haven't already been into 9 Bar, this is a great reason to go. It's one of my favorite coffee shops in Jersey City and they make excellent coffee (as well as some delicious bites to go with it). Iron Monkey is offering tailgate specials, available for pick-up or delivery and they're offering drink specials during Jets and Giants games. Congratulations to South House who celebrated their Grand Opening last week. Check out this feature on Alysis Vazquez, Jersey City chef, which explains how the Chilltown Kitchen monthly supper club came to be. This Saturday, 9/26, is the 4th dinner in Feed JC's Dinner in the Park series. Each dinner is held in a different ward of Jersey City and proceeds go to benefit the JC Parks Coalition and help feed the hungry as well as offer skill-building and job training experience for a group of Jersey City teens. There are a lot of exciting culinary and drinking events happening around town over the next few weeks, so I thought it would be helpful to just compile one complete list of dates. Sam A.M. is still holding weekly supper clubs every Tuesday through Thursday. Check in with them on a weekly basis to see the menu for each week; they usually post it on Monday. Oktoberfest at Satis Bistro, beginning at 8pm. Advance reservations are required. South House is celebrating their Grand Opening with some live Blues bands. Oktoberfest at Zeppelin Hall begins on Friday and will continue every weekend through October 24th. There will be German party bands, traditional German food and beers. 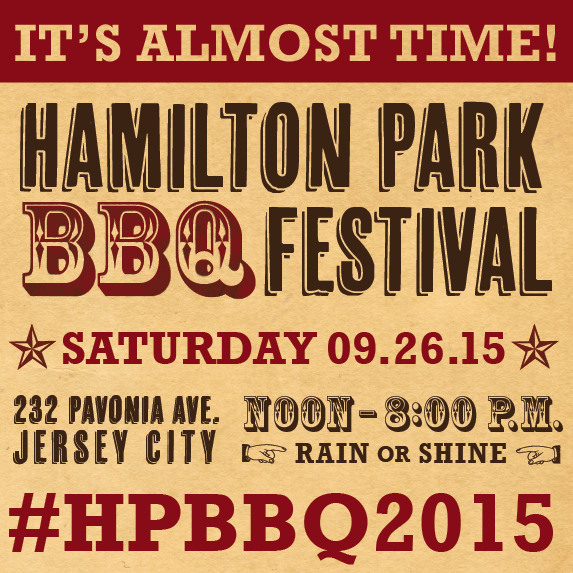 This Saturday is the 6th Annual Hamilton Park BBQ and it's sure to be a good time filled with lots of delicious eats. If you're new to the barbecue, check out my round-up from two years ago - although I have to say it's grown a lot since then. Sponsored in part by Silverman, the HPNA, Sawyer Smith Residential Brokerage and others, this annual event is a major fundraiser for the Hamilton Park Conservancy and always draws a big crowd. It runs from 12pm-8pm at 232 Pavonia outside of GP's and boasts vendors like Milk Sugar Love, Taproot Organics, Just Jenny's Love, Outer Limits Hot Sauce, and Republic of Pigtails - and that doesn't even cover the barbecue vendors. There's also live music throughout the event and fun for kids with face-painting and a bouncy house. Congratulations to Talde, Word, Skinner's Loft, Dullboy, and Taqueria for being mentioned in the New York Times on where to go near Grove Street. Talde will be hosting the next Battle of Newark Ave on Monday, 9/21, to see who the best bartender is. A daiquiri happy hour will start at 7:30 and the competition begins at 8:30pm. Prato Bakery has introduced porchetta sandwiches to their weekend menu. Congratulations to farmer's market vendors Novello Cucina and JC Fish Stand who have both recently announced they are opening store fronts. 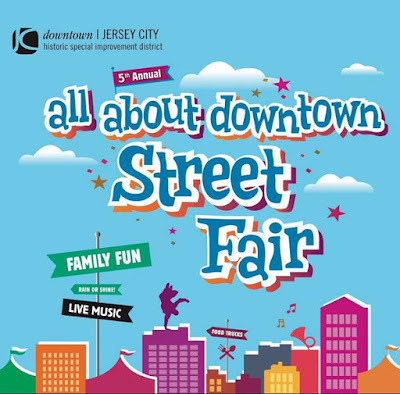 The 2015 All About Downtown Street Fair is nearly upon us and it's promising to be bigger and better than ever with over 200 vendors, an expected attendance of over 25,000, two extra hours of festival time (it runs from 11:00am-8:00pm), over ten food trucks from all around New York and New Jersey, and almost non-stop live music. 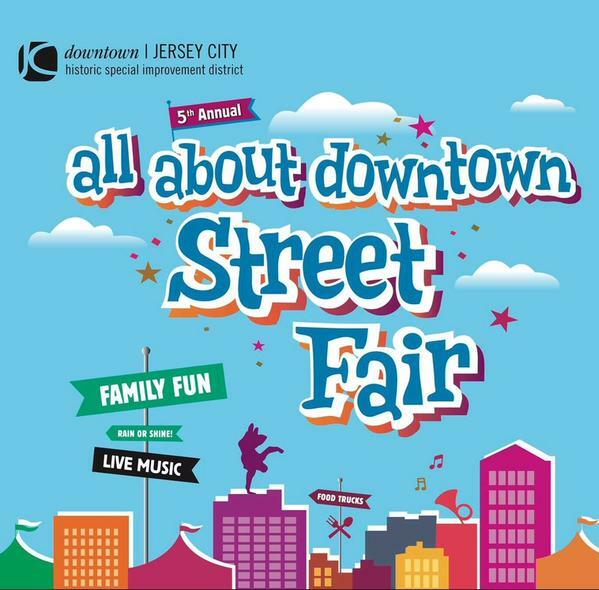 The fair will stretch from Newark Avenue at Grove Plaza all the way down to Jersey Ave.
Ready for the wekeend?! Lets start making plans. Tonight, head to WORD bookstore at 7:30pm to hear chef Dale Talde, the chef behind local restaurants Talde and Carrino Provisions, speak about his new cookbook, Asian-American. On Friday, O'Leary's Publik House will be celebrating one year in business with $2 domestic drafts all day and lots of other drink specials after 4pm. Zeppelin Hall is hosting a a country music weekend with live music Friday and Saturday nights, slow smoked barbecue, and it's also their Wonderful World of Spam weekend. 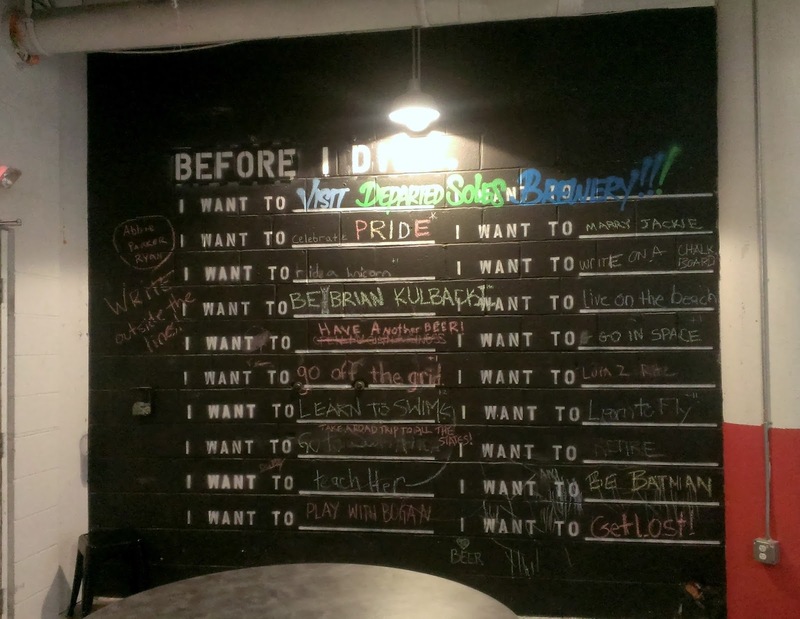 Departed Soles, Jersey City's first brewery, has been hard at work this summer, distributing their gluten-free beer to bars around the city, developing and tweaking recipes, and (the best part for us) opening the tasting room. Greene Hook opened up this weekend! They'll be open beginning at 5pm Tuesday through Saturday for now. 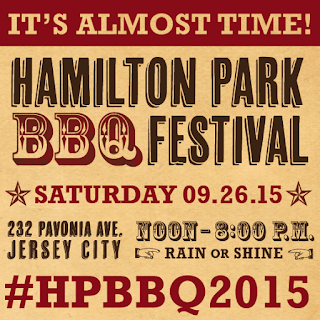 Don't forget to register for the chili cook-off at Lincoln Park on Sept. 27th. 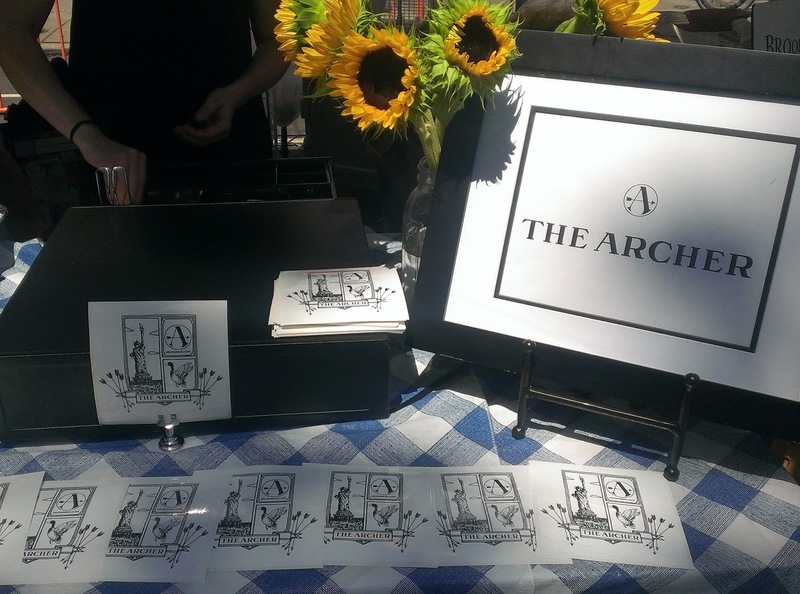 Archer Bar will be giving us another preview of what's to come at next weekend's All About Downtown Street Fair. Milk Sugar Love is now officially offering soft serve. Don't forget there's still time to join Pint Club too. Join Satis Bistro for their Oktoberfest with traditional German food and beer on September 24th at 8pm. Greene Hook, the new restaurant from Light Horse Tavern owner Bill Gray, is set to officially open to the public at 70 Greene Street tomorrow, Saturday, 9/12. The bar will be open, drinks will be flowing, and they are going to debut their signature dish, a mangalitsa pork burger (mangalitsa pork comes from a special breed of domestic pig, usually humanely raised, and is a well-marbled, very flavorful and juicy meat reminiscent of beef but with more pork flavor) topped with bacon. The restaurant itself is quite spacious, has a shuffleboard table, bar seating, reclaimed wood floors and handcrafted tables. The Journal Square Green Market runs from 11:00am-8:00pm.Village Yoga will be there holding a yoga class from 1:00pm-2:00pm and Bang Me Bakery with be there with a limited amount of their newly revamped Bust a Nutter Butter cookie along with their other offerings. This Friday is the last Groove on Grove of the season, combining with the Artists & Makers Market at Grove Plaza as part of the JC Fridays festivities happening all around town. Expect to see a lot of great vendors out there including Raval, Orale, Milk Sugar Love, Iced Tea Fusion, Koro Koro and more along with (yes, alcohol) live music, craft vendors, jewelry stands, and henna. 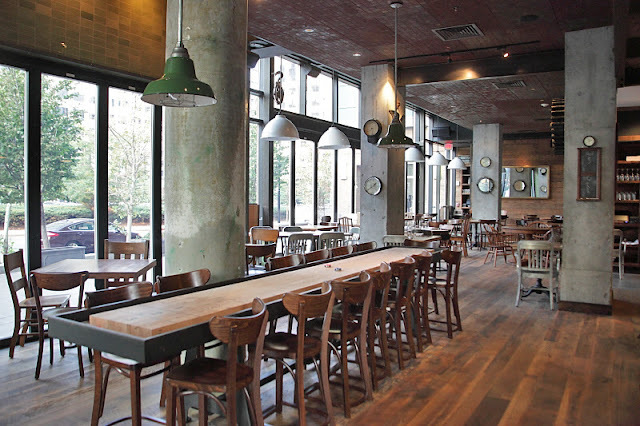 Expect another round of new places to check out, Jersey City! Some of these have been long term projects, others seemed to have popped up almost overnight, but we've got more restaurants and coffee shops headed our way. Here's a round-up of some of the new food and beverage spots coming to town. Archer Bar, which was previewed at JC Project Eats, will be opening in the former Box Spring space at 176 Newark (they moved in with More on Grove) and will focus on specialty cocktails with a limited menu available, along the lines of elevated and revamped bar food. Their original projection for opening was mid to late September and I did recently see what looked like booth seating being moved in so it seems like they're close to meeting that timeline. I think we can expect to see them open within the next month. 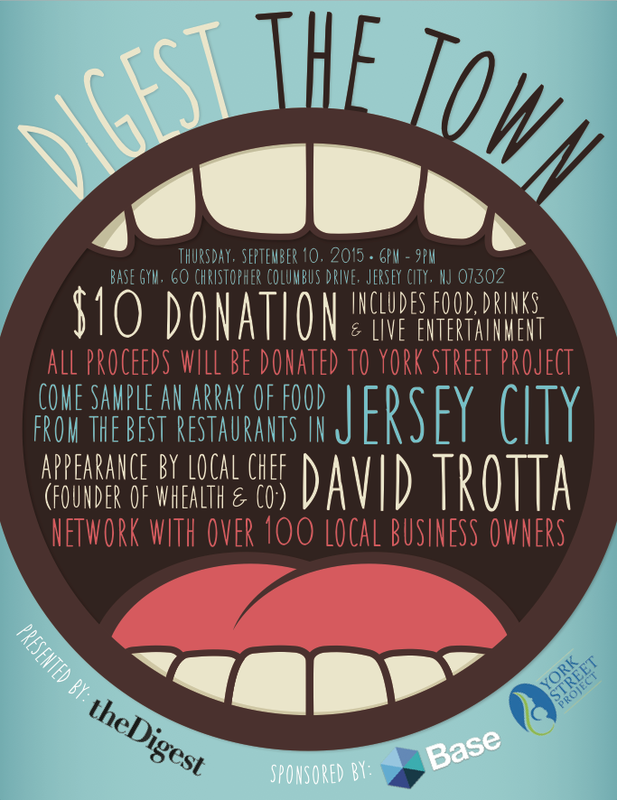 This Thursday, Sept. 10th, join The Digest as they host a networking event in collaboration with David Trotta of Whealth and Base Gym benefiting the York Street Project. Milk Sugar Love is bringing back the Pint Club! And the final summer sundae, a collaboration with Thirty Acres, is now on offer every weekend in September. Sam A.M. announced their three day supper club menu for the week. Art House is hosting a Fall Spectacular next Saturday with food trucks, live music, beer tasting, and a cake baking contest. Dark Side of the Moo is hiring. Carvao BBQ was featured in The Jersey Journal. We all know what Labor Day Weekend means: Summer is officially winding down. But if you're staying in town, you might as well make the most of it! Thirty Acres will be open Saturday, but closed Sunday and Monday per their normal schedule. Milk Sugar Love will be open for regular hours all weekend but closed Monday per their regular schedule. Battello will be closed all weekend, beginning Friday, and reopening Tuesday for lunch. The Grove St. Farmer's Market will not be open on Monday. Fast Boy Delivery is offering a Labor Day Weekend Delivery Special - 10% off on Saturday and Sunday. The Journal Square Green Market will run as usual on Friday from 11am-8pm. They'll have fruit and veggies to stock up on for the weekend, fitness classes, Taproot Organics, and an ever-expanding food vendor roster. Friday night is another great night for the RNA's Live at the Lumberyard with great live music, food trucks, and more. El Chilango will be there, bringing special spicy shrimp ceviche tostadas with them.